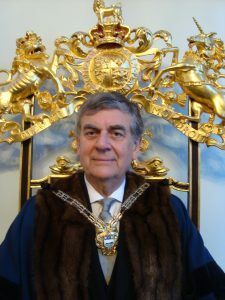 Dr Iain Reid was installed as the 192nd Master of The Company of Watermen and Lightermen of the River Thames on July 11th at 11.00 am. After the closure of the Installation Court the Master and the Court, processed to All Hallows by the Tower led by the Company Bargemaster, Doggett’s Winners and the Beadle for a service of blessing. Afterwards the new Master and his lady, Mrs Susan Keane, received their guests at Trinity House, Trinity Square for the Master’s Reception.